Who would’ve thought that a night of drunken passion, which Ginny couldn’t recall for the life of her, would lead to her becoming flatmates with Draco Malfoy? There are situations in which being a Weasley is a bad thing. These situations include, but are not limited to, getting caught in the middle of an open hallway straddling one Draco Malfoy with one’s lips planted firmly on his. Treasure. Secrets and espionage. A mysterious oil painting. Draco Malfoy has gone missing, and Ginny Weasley has been hired to find him. It’s the perfect storm for adventure—one with a dangerous outcome that no one, not even Ginny, could have predicted. Sometimes it’s the prince who needs saving, and more than one kiss is required to achieve the fabled happily ever after. Of course before that happens, it’s always helps if the prince can avoid the princess’s mean right hook. 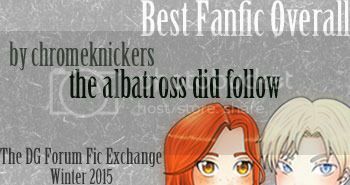 MOD'S NOTE: Don't forget that the link to vote for this fic to win the FIA D/G Summer Challenge can be found right here.